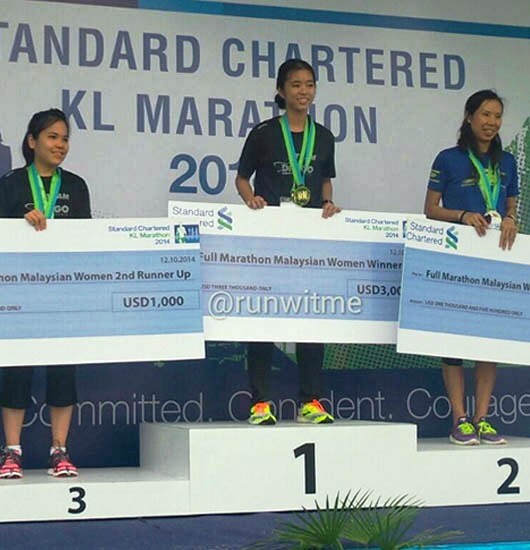 UTAR Accounting student Ms Loh Chooi Fern won the Malaysian Women’s category at the recently held Standard Chartered KL Marathon (SCKLM) 2014. She received a cash prize of USD3,000, a medal and a certificate of recognition. With competition from 30,000 runners in the gruelling marathon, Loh succeeded due to much grit, determination and intensive training. Winning the SCKLM 2014 is another feather to her cap for Loh was the star athlete in Sukan Institusi Pengajian Tinggi (SUKIPT) 2014 with three gold medals. Ms Loh who is also a UTAR scholar, recalled that the toughest time in the marathon was the last lap towards the finishing line as she almost gave up the race. However, the cheers from supporters and the inspiration from her mentor and coach, Yuan Yu Fang (a Malaysian national walker) drove her on to clinch the sweet victory. The victorious lass said, “It is possible to balance study and sports. It needs self-discipline, commitment to goals and proper planning to achieve the success. Juggling between lectures, assignments and going for trainng and workouts can be exhausting. However, with self-determination, it is possible to achieve our goals.” She also added that winning the marathon has boosted her confidence and motivated her to join higher level competitions with focus on improving her timing, endurance and performance. Loh thanked her coach, lecturers, fellow students and supporters who provided much advice and expressed hope that her achievement would motivate more students to be active in sports.